Custom Billet Grilles are here to stay! Back in the late 80's early 90's a new trend was started in automotive customization. People wanted to customize their vehicles to make them different and more attractive than the one next door. There was a demand for accessories that would "personalize" a vehicle to the owners liking and taste. Next to wheels and tires, custom grilles became one of the most popular ways to "dress up" a vehicle. A billet grille is a grille or grill made from aluminum bars called billet aluminum and is designed specifically for appearance with some functional benefits too. For example if you drive in an area that has large bugs or rocks on the road, a billet grille can protect your grille and radiators from damage and clogging. Billet grilles can be manufactured on a CNC machine or welded together using a tig welder or robotic welder. Billet Grilles are powder coated black and then the face is polished to a show quality chrome-like shine to finish it. There are three types of custom billet grille. The correct type for you will depend on your type of vehicle and your preference. 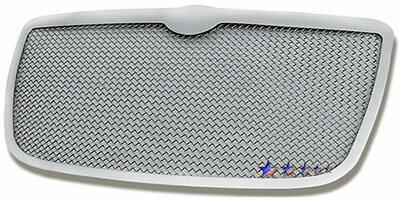 The first custom billet grill we'll look at is the traditional and classic Billet Grille Insert. This is the one that started it all. For this type, the factory grille on the vehicle has to be modified, usually cut out with a dremel or jig saw. The Billet Insert is then inserted into the opening in the factory grille and secured with fasteners provided with the billet grill. This type of billet grille is very popular today and gives a more "factory" look when finished but takes a little longer to install. The second type of billet grille is an Overlay/Bolt-On Billet Grille. This is a much easier billet grille to install as it bolts directly onto your existing grille, usually with no modification to the factory grille. This type of billet grill is great for quick and easy installation that looks great. The down side to this type of grille is you can see the factory grille behind it, especially if it's not painted black. If you have a black factory grille, then this is generally not a problem. Many Overlay Bolt-On billet grilles (eg Ford & GMC) have a cut out in the center for the OEM (Original Equipment Manufacturer) emblem to show through. The third type of custom billet grille is the Replacement Billet Grille. This is exaclty as it sounds, it completely replaces the grille on your vehicle. Remove the old grille and replace it with the new custom billet grille. These grilles give your vehicle a custom look with a straight forward and relatively easy installation. The instructions included with your new billet grill will tell you how to remove your existing grille and how to install the new grille using the hardware provided. Descriptions on the product pages will indicate type of grille. Powder coated black or chrome plated utilizing five step process. Polished to a chrome like shine on face of grille. Shipped with instructions and hardware. Custom mesh grilles are a new alternative with a unique look derived from classic european vehicles such as the Bentley and Jaguar. Wire mesh grilles are generally made from 304 marine grade interwoven stainless steel wire mesh and some come with a frame which is CNC machined. Mesh grilles are finished by electro polishing or chrome plating. They are available for many different makes and models of cars, trucks and suv's. Mesh grilles are available in three different styles. Some mesh grilles are installed as an insert where cutting is required for removal of original grille work. Others simply fit directly into opening already in the grille. Finally, some mesh grille completely replace the OE factory grille. Built to meet or exceed OEM specs. Will not rust or dull. Custom ABS aftermarket replacement grilles come in all different shapes and sizes and styles. From OEM factory replacement to complete custom design applications, ABS plastic grilles are a quick and easy way to customize your vehicle or replace an accident damaged grill at an economical price. Why pay exorbidently high prices for an orginal OEM grill at the dealer when you can replace it with a high quality aftermarket grille at a fraction of the cost! ABS replacement grilles normally come in all chrome finish with some exceptions of titanium and black or smoked chrome. The fit and finish or our quality replacement grilles are guaranteed to match that of OEM standards. A less expensive and more viable alternative for accident damage replacement.